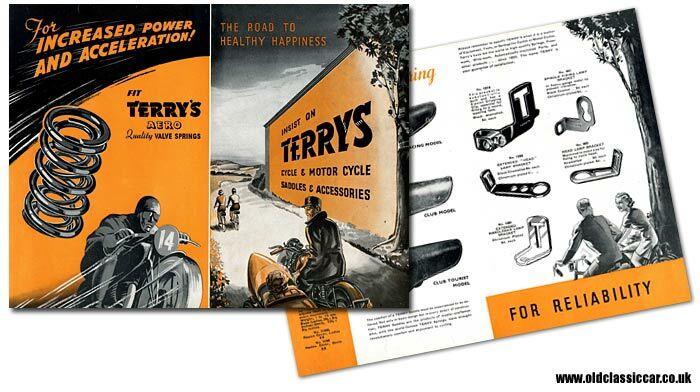 Terry's bicycle & motorcycle accessories in the 1930s. Homepage. This page: A pre-war leaflet describing the motorcycle and bicycle accessories offered by this British firm. Terry's Cycle & Motorcycle Saddles & Accessories. 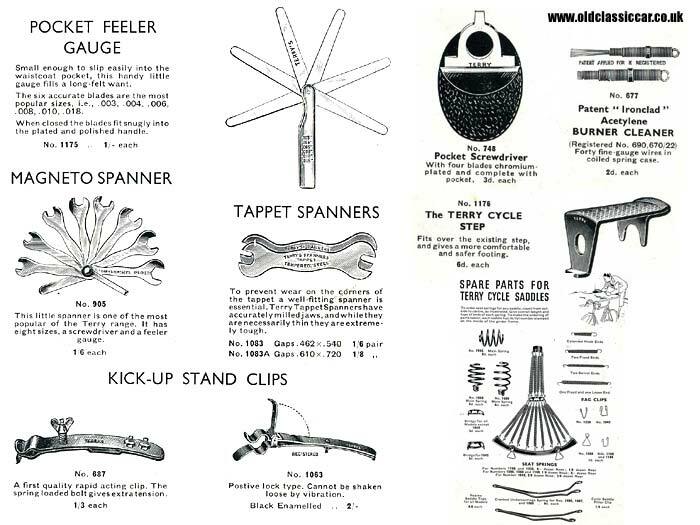 There can be few cyclists or motorcyclists in the 1930s and through to the 1960s, that have never had any item from the Terry's accessory catalogue in their shed or garage. As a non-cyclist myself I can lay my hands on a number of Terry's magneto spanner combination sets, and quite probably several old tyre levers. I know for a fact that there are some Terry's trouser clips hanging up in the garage, unused and still on their original shop display card, along with a couple of tennis racket holders no less, designed to clamp onto a bicycle's front forks. This fold-out advertising paper probably dates to the late 1930s and features both cyclists and motorcyclists on its cover. To the left there's an advertisement for something familiar to fans of four- rather than two-wheeled transport, namely Terry's Aero valve springs, a popular fitment to cars for many years. 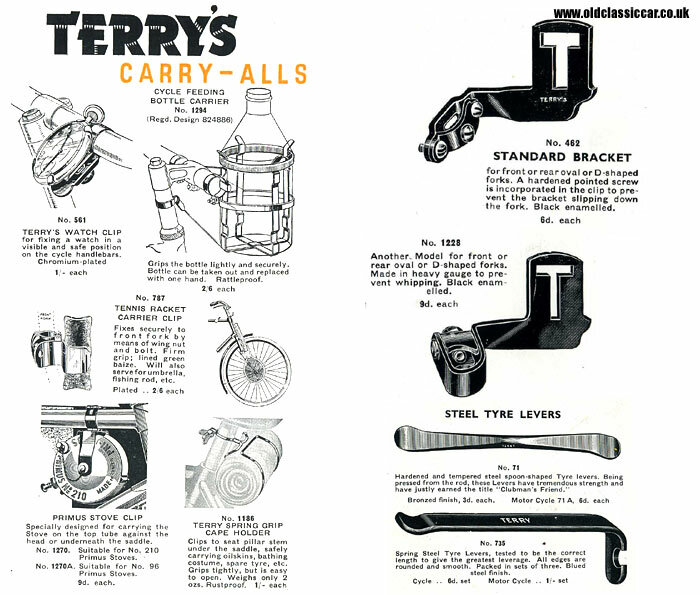 Now for a peek inside this interesting old leaflet, and a look at some of the accessories Terry's had to offer. As already mentioned, Terry's produced a wide variety of pocket tools, designed to aid the unfortunate rider whose machine had expired at the side of the road. 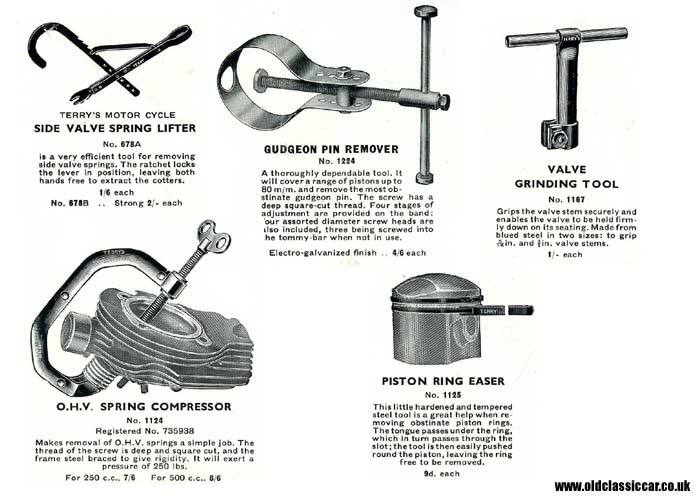 The image below describes some of them, including a valve spring lifter designed for sidevalve engines, and another for OHV units, a gudgeon pin remover, a valve grinding tool, and a piston ring easer, all designed with the hands-on motorcyclist, rather than pedaller, in mind. Many motorcyclists wouldn't bat an eyelid at stripping down their motorcycle's engine at the side of the road, or in the kitchen at home, to cure a problem. 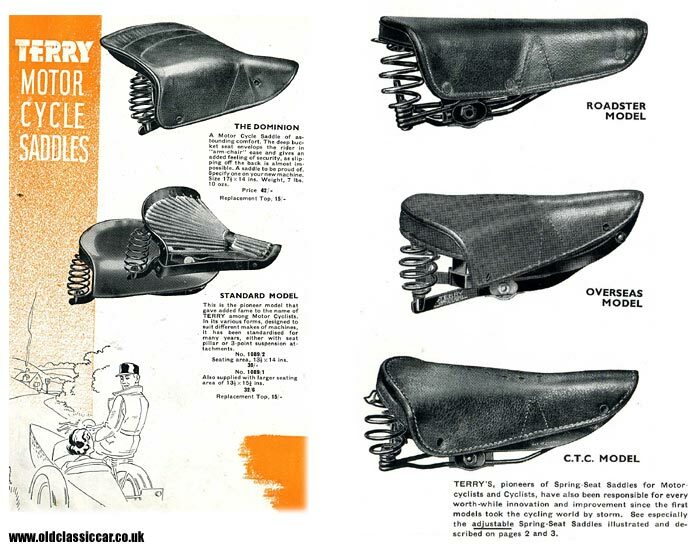 Given their interest in springs, perhaps it's no surprise that the company marketed an extensive range of sprung saddles, for motorcycles and bicycles alike. Those shown below are the Standard saddle, the Dominion, the Roadster, the Overseas model, and the C.T.C. saddle. On other pages there are also descriptions given for the Racing, Club, Club Tourist, and the Super Roadster. Some saddles were adjustable, enabling the rider to adjust the amount of "spring-iness" offered to their backside. A simple adjuster, operated by twisting a coin in the slot, gave a range of adjustments to suit all posteriors and terrain. Cyclists riding on a shoe-string would simply opt to tuck their trousers into their socks, but for the majority the option of using proper cycle clips would probably be more appealing. A variety of trouser clips were offered, along with a nifty little route holder - perfect for club cyclists taking part in a road run - plus inflator clips, designed to enable the carrying of a hand-pump on one's machine. More cycling accessories to tempt the bicycle enthusiast. Anyone wishing to further customise their bicycle would find a tantalising array of useful accessories described within the pages of this Terry's catalogue. What serious cyclist could resist the bottle carrier or watch clip for instance? The tennis racket holder would be an essential purchase for any Fred Perry wannabees out there, while campers would no doubt have handed over 9d for the handy Primus stove clip. Scattered amongst the bicycle-related goodies are various items designed to appeal to the keen motorcyclist. No serious motorcyclist would ever leave home without a basic tool kit tucked away somewhere on their bike. It would no doubt have included a set of pocket feeler gauges, a magneto spanner, tappet spanners and quite possibly the pocket spanner set. Tyre levers might also have come in handy. Interestingly, Terry's also offered a complete range of springs to enable someone to rebuild their own saddle. Whereas nowadays you'd simply be expected to chuck your broken saddle in the bin and buy another seat, in those days you could simply visit your local bicycle shop, and buy individual springs, clips and even a replacement piece of Rexine to finish the job. More items relating to old vehicles can be found in the Motoring Collectibles section, while information relating to pedal-powered cycles can be found on the vintage & classic bicycle page.